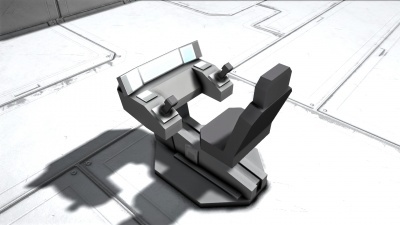 The Flight Seat is a block that allows the player to control a large ship or station. It allows the user to manually control movement, rotation, tools, and weapons. While having many of the same functions as the Cockpit and Control Station, the Flight seat allows a full unobstructed view of its surroundings in 1st person mode. 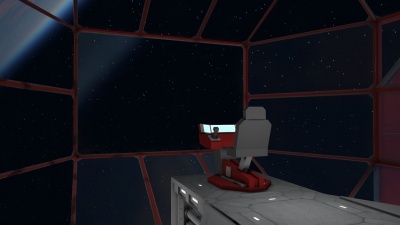 This allows the player to see the immediate surroundings, even more so than the cockpit. Flight Seats only take 1 block space, and may only be placed on large ships and stations. While the player may place as many as they like, only one is needed. Every cockpit can be set to control wheels placed on the grid. When a cockpit is set to control wheels, it will instead attempt to move & turn in the directions using the wheels to propel it forward or backwards. Keep in the mind, currently the only way to halt the vehicle to a complete stop is by using the hand break feature in the control panel. You can select if a particular Flight Seat has access to the Thruster system. Useful in a multi-player ship. This is a toggle of an invisible item. If this is checked, the Hand Brake is engaged and the wheels will not turn. If this is unchecked then wheel movement is allowed. Note that it may be difficult to get the wheeled vehicle to come to a full stop without using this item. The Hand Brake is built into the Wheel & Suspension system. This is a toggle of the Inertial Dampener system. If you're using wheels, you can place the hand break function on the toolbar for easy-access! If placing a Flight Seat right below a window block within an airtight room, a seated player will begin to suffocate despite it being in an airtight area. This page was last modified on 19 September 2018, at 20:56.